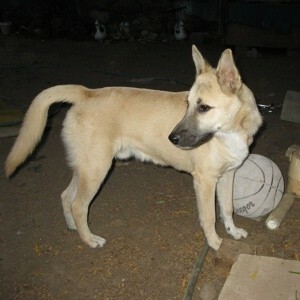 I have a Husky/German shepherd mixed dog, he's nine months old and he's feisty, energetic, and a trouble maker. He seems to have a hard time learning due to his excitement about everything. Any tips, suggestions, or ideas on how to help me train him? I'd get a book (from a used books store). Start small with maybe a sit command and treats. Only give treats for obeyed commands. Your mixed breed of dog is very, very high energy. This dog needs way more then a walk in the park, he needs to run, run and run. Is there an off leash park you can take him to? Maybe throw the ball. Does anyone jog or hike? I think before you can do training with him, first he needs to burn off his energy then he will be calmer to train. Remember to always be positive and never hit your dog for misbehaving. Sometimes people buy a breed of dog that just doesn't match their lifestyle.ie: people who like to hike hours at a time shouldn't expect their yorkie to keep up with them. Cesar Milan has some great tips for raising dogs. Check him out on youtube, the library, or his website. Best of luck. I agree with S Singer. I have a shep/husky/dobie cross....extremely high energy! Eats everything in the house; couches, chairs, walls, toys, clothes, etc. but only when we are out and she is bored. She is now "reverse crate trained". When we go out, I put her crate on the cement floor in the basement and lock all her toys and a few smelly treats inside. She spends hours trying to get them out. As she flips the wire kennel over, a few treats fall out. I release them when we get home and take her for a run. Works for me! I also have the same breed (aunt) older dog, who calmed down a lot as she got older...so wait a few years and you will have a quiet dog...good luck until then!